A new hand-held imaging tool takes the planning out of scanning. The Magic Wand from VuPoint Solutions may be the sleeper productivity tool of the moment: It's a scanner you can put in your pocket. 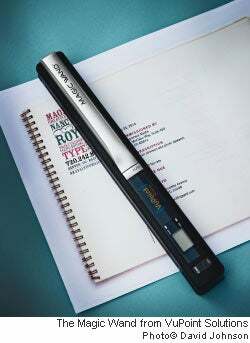 The 10-inch long, 7.5-ounce imaging scepter captures a high-quality scan of any photo, pattern or text up to 8.5 inches wide. And it's one-button simple to operate. Fire it up, slide it smoothly across the work and out comes a reasonably high-resolution, desktop-quality image of the original. No additional lighting required. Hundreds of images can fit into the 32GB max microSD card, and scanned content can be stored to your computer via a USB connection. VuPoint, based in City of Industry, Calif., specializes in low-cost, easy-to-use gadgets that retrofit older technologies into newer high-tech trends. "We see today's small businesses archiving and recording important company documents with the Wand," says Brant Williams, VuPoint executive vice president. The gadget, which retails for $99.99, is far from perfect. The control screen is so small that managing the scan library is best done on a PC. And be sure to edit all documents generated by the optical character recognition--some text translation can be rough. Still, there's a legit small-business handiness to something that puts a business-class image-capture tool in the palm of your hand. No smartphone camera comes close.